Disclaimer: the only tiger in this post is the ceramic one in the picture below. Burda’s June 2014 issue had a great story on Japanese-inspired styles. This is model 104, a very simple jersey dress with a twist detail on the body and sleeves. I can’t see anything particularly Japanese about it, but suspect the starting point may have been the Japanese Pattern Magic books which contain a top with a similar body twist. December probably wasn’t the best month to make this. The neckline is wide – only just covering bra straps – and low at the back. 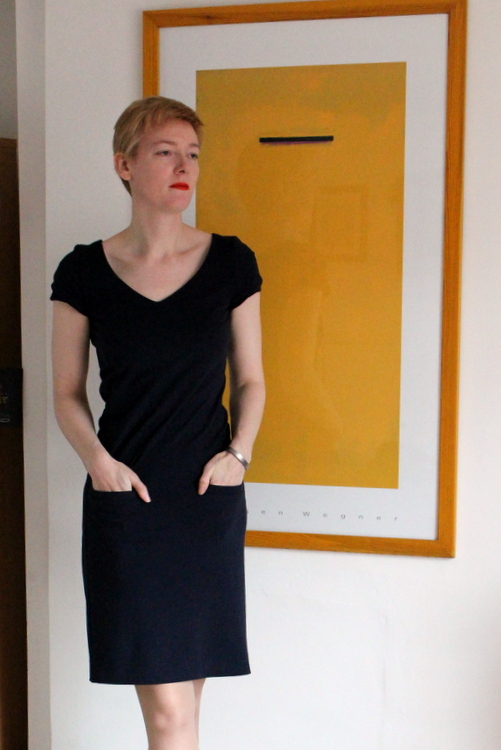 I have been mostly wearing the dress over a long sleeved t-shirt and thick tights! Which works OK, but it looks better like this. It’s made from a very elastic doubleknit fabric. It’s mainly viscose. I don’t remember the exact composition but there must be some lycra in there too as it’s got great recovery. I added little single welt pockets to the front. I was nervous about making those in a knit but they came out well. Time spent making pockets is never regretted afterwards in my experience, but my goodness it slows a project down. This is a very simple dress to sew and adding the pockets more than doubled the time taken. The back view is super-plain although I think the neckline and twist just save it from coffin back syndrome. It’s slightly fussy to wear. The twist has a tendency to straighten itself out and then it looks like the side seams are crooked. Burda’s garment photo has this problem too so it’s not just my version! I suppose I could take it in a little to try to make it stay put but I think that might end with it becoming uncomfortable. I wore it quite a lot over the Christmas break despite all this so I’m calling it a qualified success. I doubt I’ll make it another but this one has a place in my wardrobe. Thanks for all the suggestions about a belt for the Jedi dress. There’s a clear majority in favour of metallic so I’m going with that. Janene came up the great idea of making one out of metallic pleather and it just so happens that I have some silver pleather scraps over from another project – here’s hoping there’s enough left! 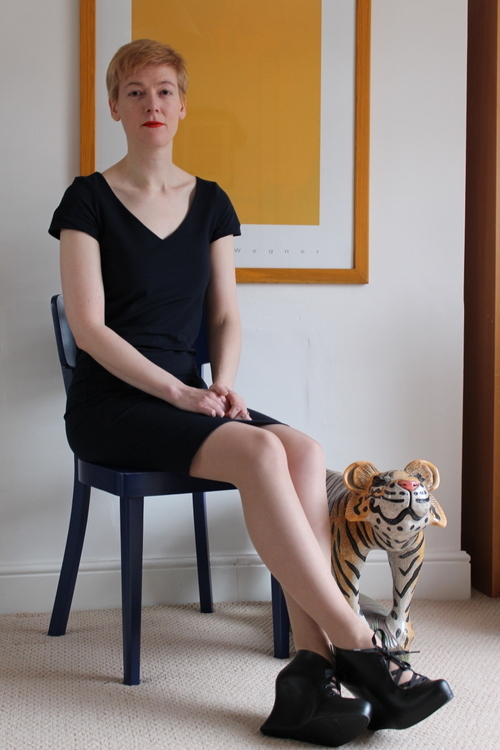 Posted on January 10, 2015 January 8, 2015 by catherinedaze	This entry was posted in burda, dressmaking, Finished, sewing and tagged blue, burda, dress, dressmaking, japanese, sewing, tiger. Bookmark the permalink. This looks so good. I can see where the twist would attempt to straighten itself out. I have the same issue with a Donna Karan skirt made a few years ago. Your addition of welt pockets is brilliant, and I agree that welt pocket practice is never a loss. My DD1 has shoe envy, btw, and would love to know more about your fabulous black shoes. Thanks! The shoes are Vivienne Westwood for Melissa; she’s got a regular collaboration with them. Melissa shoes are all made out of plastic which isn’t as uncomfortable as it sounds. These are about as wearable as anything that height can be but I’ll admit they’re only for blog pictures and parties. So how does the pattern incorporate the twist? I can’t get my brain to imagine it. I’m so curious! I like the dress a lot – glad you’ve found ways to layer it enough for winter! Thanks! Yes I went for a crop a couple of months ago and I’m really pleased with it. No styling required either. The pattern has a sort of sideways shift below the bust. Imagine sliding the hem to one side while keeping the bodice still, so the side seams are slanted. Both front and back pattern pieces slide the same way (looking at both right side up) so when you sew them together the slants are opposed to one another. I hope that made sense! You look great in it! I think the twist would drive me crazy wearing it (like wearing off grain shirt) but it’s very flattering for your waist! those Burda patterns fascinate me, and seem to be an easier way to make items similar to the Japanese styles. I made one of the twist tops using the design in the Pattern Magic book, and while I like it when standing still it absolutely would not stay twisted so it seemed kind of pointless. I wonder if a thin knit lining cut on the straight underneath would maintain the twist. anyway it looks fantastic on you. It looks great on you. The dress is very flattering. Looks great! The twist straightening out could be a nuisance. I made a few twist tops in jersey from PM, the twist stayed in place, but when I had the idea to elongate the pattern into a dress the twist untwisted. I wonder if its to do with the movement at the hips ( walking, sitting and so on). I had to leave a comment and say how fabulous this dress is! Love the pockets! Maybe you could start a slow pocket movement, like slow food but less pretentious. And “Coffin back”? What the heck is that? Love the reference to ‘coffin back’ -( I think I heard it first on The Fashion Incubator site maybe )- it always makes me want to add some interest to the back view of a garment! Very elegant was what I thought too! Love your new hair do/colour too. So so pretty on you. And I love your ceramic buddy as well. A perfect LBD for you. It looks great. And I love your tiger! I am seriously impressed you added welt pockets, in jersey no less. This dress looks great on you, I love the pattern, it’s very cool and I can see it being influenced by the Japanese drafting books. that’s really beautiful & incredibly flattering on you. I’d mark it as a total success.